The UK is spoilt for choice when it comes to airshows - a hobby that allows any enthusiast to witness some of the finest machinery and pilots in the world. However, the "fly-in" is an event that should not be disregarded, having proven in the past that you can still have a brilliant day out for little or no cost. 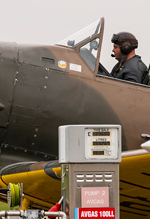 Northampton/Sywell's second edition of "The Radial & Training Aircraft Fly-in" certainly excelled in showcasing some fantastic aircraft in a more laid back atmosphere. But for myself, the added joy of flying into the event provided a whole new kind of adventure. Making a flying arrival, Dan Ledwood reports for UK Airshow Review from the blissful surroundings of Sywell. Words and photography by the author and additional photography by Sam Wise. With the start of October comes shorter days, colder weather and unfortunately the end of another UK airshow season. However, that didn't stop Andrew O'Dell and the rest of the organising team attempting to ensure that a good mix of radial-engined and ex-military training aircraft were collected, with the first themed fly-in earlier in the year certainly showing promise aplenty. Arguably the most appealing prospect of a fly-in, from an aviator's point of view at least, is the opportunity for yourself and a few friends to be an integral part of the event. With the potential of some rarities that are seldom seen at airshows, it was decided that this would be my first "aerial arrival" to a fly-in event. The flight planned for a departure from Bournemouth/Hurn via Middle Wallop and Oxford the night prior and everything was looking perfect for the flight northwards. The flight in question would be completed in G-AXIO, a 46 year old Piper PA-28-140 Cherokee affectionately known as "India" by myself and those that fly her. 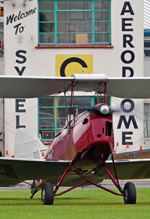 Over its career, the aircraft has seen service with flying schools at Cranfield, White Waltham and also Bournemouth. Early the next morning, however, it looked as though all the excitement and trepidation prior would be for nothing. Dense fog had enveloped the airport, with forward visibility down to 500m meaning only IFR flights were allowed to operate. With the estimated departure time of 08:30 slipping back by approximately two hours the clag began to lift; hazy but flyable conditions with Special VFR clearance to leave Bournemouth's controlled airspace. Myself and my friend quickly readied for departure, checked the aircraft and the systems over one last time and taxied to the active runway. As I powered down Hurn's runway 26 the engine temperatures and pressures were all reading good and a gentle pull aft on the control wheel lifted us into the air. "300ft clean wing...700ft 180 degree turn...1000ft landing light and fuel pump off" all called out for the sake of good airmanship and situational awareness as we made a 180 deg. turn to allow for a heading towards AAC Middle Wallop. After departing Bournemouth's controlled airspace we climbed the Cherokee up to 5500 feet with a very thin layer of mist giving the interesting illusion of flying at an altitude of a commercial aircraft, albeit a lot slower! We passed noticeable landmarks including the ex-RAF Greenham Common, Didcot power station and Dalton Barracks; the warm October sunshine and still wind conditions providing idyllic flying weather with very little general aviation traffic in the region. Approaching Oxford, a distinct layer of low-level stratus clouds meant for a rather sharp descent to prevent getting caught within the inclement weather - unfortunately resulting in an 1800ft cruise to our destination under heavy grey skies. I continued to press on but it seemed as though, 15 nautical miles out, that the aircraft would have to return back to Bournemouth due to the weather looking very unpleasant. Things certainly did not help when the pilot of a Beech Bonanza approximately 10 minutes flying time behind us requested a weather brief from Oxford Radar, resulting in myself having to relay the unfavourable information to the Bonanza pilot. Luckily the cloud stayed just high enough, and eventually Northampton and Sywell Aerodrome loomed into view - with almost continual radio transmissions making myself aware that a good look-out for traffic would be a necessity. With the airfield information received and joining the circuit pattern in the overhead at 1500ft, we formed up behind a Tiger Moth, T67 Firefly and a locally based ultralight. With a reasonably large group of enthusiasts dotted around the airfield it certainly meant that the landing had to be perfect. Luckily, the calm northerly winds allowed for the PA-28's landing gear to kiss the concrete of runway 03L before making a quick deceleration and runway vacation to allow for a Bulldog to land behind. Making our way across the freshly-cut grass it became apparent just how much of an effect the inclement weather had taken on the number of visiting aircraft. Unfortunately, of approximately 53 scheduled arrivals, a swathe were unable to attend due to poor visibility and low cloud dominating the majority of the UK. For instance, of the seven Harvards that were due to attend only 3 managed to forge their way through the weather. Other noteworthy aircraft sadly missing included a pair of Beech 18s, Percival Pembroke, and the Wycombe Air Park based Yakovlev Yak-11. Despite the cancellations, none of this seemed to really matter. One of the benefits to a fly-in are the lack of barriers, fences, or necessity to be hemmed into an enclosure; so the opportunity to spend an afternoon sat under the wings of your aircraft as the world passes you by is one that can very rarely be enjoyed. Joining both myself and my passenger on the "live side" was fellow UKAR Staff Member Sam Wise; which certainly made for an amusing and humorous couple of hours of aviation-related japery. One particular highlight that caught the attention of most people was an immaculate Travel Air 4000 which had been imported from the USA a month previously. The aircraft, which first flew in 1925, was accompanied with other rarely seen American radial designs - including a bright yellow Staggerwing and one of only two Stinson V-77 Reliants in the country; the other sadly succumbing to the poor weather. Numerous other aircraft also made the journey to the Northamptonshire airfield, most noticeably the Boultbee Flight Academy's Spitfire TIX, offering pleasure flights alongside a wide variety of ex-RAF training aircraft. The rarest aircraft, however, did not arrive by air, but via road; for an event that was technically never part of the fly-in. Taking centre stage for Sloane Helicopters' anniversary celebrations was a Westland Widgeon from Norfolk & Suffolk Aviation Museum. With just 12 airframes being constructed and a further 3 converted from the Westland Dragonfly, the helicopter technically fitted into the radial theme due to its powerplant being an Alvis Leonides air-cooled radial engine. The presence of jet training aircraft also made a welcome change to the plethora of prop-driven aircraft, with two very rare examples making a welcome visit. 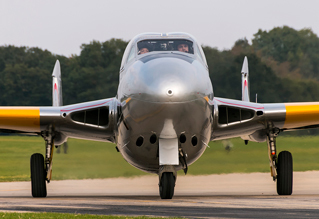 Arriving on the Friday in preparation for the fly-in was the only Vampire T11 known to be flying in the Northern Hemisphere, making a fantastic return having been on the ground since July. 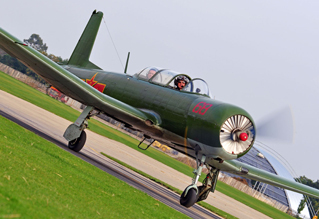 The aircraft departed late afternoon for a quick photoshoot with a Chipmunk in identical RAF training colours, plus a Nanchang CJ-6 acting as photo-ship. The Vampire returned and performed several high-speed passes and impressive zoom climbs, the sound of the Rolls-Royce Goblin reverberating off the hangar walls. 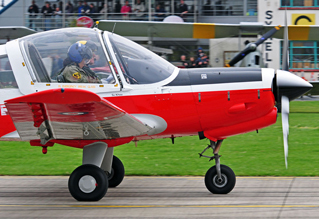 The second of the jets also calls North Weald its home, with the world's only airworthy Jet Provost T52 popping in for a couple of hours for "tea and medals" before departing back to base. Unfortunately, despite the weather improving as the afternoon progressed, it was time for me and my passenger to prepare the aircraft for departure towards the South. 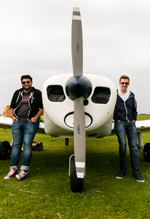 Deciding to opt for the use of the grass runway on departure, we made our climb-out into the milky cirrostratus sky with a rock of the wings in acknowledgement to the dwindling crowds and Air Traffic Control. Despite the cloud being much higher on our return leg (allowing for a cruising altitude to be set at 2,600ft), the visibility certainly wasn't perfect as we flew facing the sun - meaning it was quite tricky to see any conflicting traffic. But as we made our way over a number of hot air balloons above Oxford and continually lengthening shadows, the radio chatter gradually reduced as we approached Solent airspace and onto Bournemouth Radar. Touchdown back at Bournemouth was an uneventful affair, with no traffic in the zone as we approached evening civil twilight under a developing layer of mist. After shutdown we hopped out of our PA-28, covered the canopy, strapped the aircraft down, inserted the chocks and let her Lycoming engine tick cool.